Definition of the Atlatl. The Atlatl was an ancient type of Spear thrower, a 'throwing stick' used to throw a spear with greater propulsion towards the quarry. The Atlatl was used to propel throwing-spears or "darts" and used prior to the appearance of the bow and arrow. Essentially the Atlatl lengthens the length of the spear thrower's arm and with a loaded, spring-like, action can provide the benefit of greater force and distance over that of the hand thrown spear. The spears thrown from the Atlatl ranged between 4 - 5ft in length. The Atlatl had a range up to 500 feet and the power to inflict serious injuries with more speed, force, and accuracy than spears that were thrown by hand alone. The word 'Atlatl' derives from Aztec meaning a spear throwing stick device. How do you pronounce Atlatl? Try this: "at-uhl at-uhl". The Atlatl was used in most parts of North America prior to the appearance of the bow and arrow. The Atlatl were commonly used by the Pueblo and Creek Native American tribes in the Southwestern area of America for hunting deer, elk, rabbit and bears. The Atlatl was also used by the Artic and Sub-Artic Native American tribes in the far Northern areas of America for hunting land animals and large marine animals such as whales. At one end of the spear thrower was the 'grip' - where the thrower would grip the weapon. The other end of the Atlatl was a 'spur' or 'cup' in which a hollowed area in the end of the spear rested. The spur was a blunt point carved into, or added onto, the end of the atlatl. The spur point or tip fits into a hole (or cup) in the end of the dart. Throwing an atlatl required skill and a secure grip on both the thrower and spear to keep the two engaged until the spear was thrown. Feathers were sometimes added to the spear to increase accuracy. 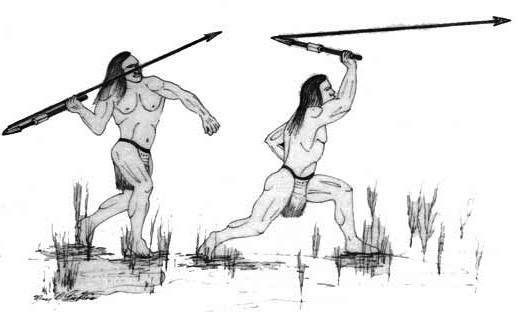 The use of the Atlatl improved the ability of the hunter to cast a spear farther and faster due to the mechanical advantage of lengthening the arm, increasing the amount of thrust and killing power of the weapon.